X_TRADER provides the ability to create and manage algo templates. These allow you to save frequently used variable settings for future use. For example, you’ve created an algo designed to run on different instruments, but do not want to change the instrument each time that you start the algo. Instead, you can change the instrument variable and save the algo as a new template. Templates are server specific, meaning if you create a template on AlgoSE-A for an algo that is on both AlgoSE-A and AlgoSE-B, the template will only be available on AlgoSE-A. If you wish to use the template on AlgoSE-B, you will need to create a separate template on AlgoSE-B. Warning: When an algo is redeployed on an Algo SE server (e.g., updated with a new version) all templates associated with the algo are removed. This prevents an old template from referencing variables that may have new meaning or might not even be present in the newly updated version of the algo. Tip: All algo templates are private and cannot be seen or used by others. Algo templates display in the Algo Explorer tree structure below the associated algo. Although templates are private, Algo users sharing an order book can manage (Pause/Run) and manipulate algo variables once the owner has started the private template even when the Share parameter is not enabled. Select the desired algo in the Algo Explorer pane. This displays the algo variables in the Algo Variable pane. Edit the variables as needed. 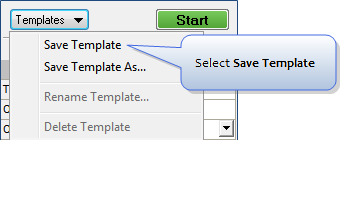 Click the Templates drop-down at the top of the Algo Variable pane and select Save Template. This display a dialog box a suggested template name of "New Template". If "New Template" already exists for the algo on the Algo SE server, then the proposed name will include an integer enclosed in parentheses (e.g., New Template (1)). Tip: You may also select the Save Template As... option. Type a template name and click OK. This creates the new template and displays the template name under the associated algo in the Algo Explorer pane. Tip: Once you have created an algo template, you may save your current template parameters with a new template name, rename the template, or delete the template from either the Template drop-down or the right-click template context menu. Select the desired algo template in the Algo Explorer pane. From the Algo Explorer pane, click Delete. From the Algo Variable pane, click Delete from the Templates drop-down list. Click Yes to confirm. This removes the template from the Algo Explorer pane. From the Algo Variable pane, click Rename from the Templates drop-down list. The Enter Name dialog box appears. Type the new template name. Click OK to confirm. This updates the template name in the Algo Explorer pane. Tip: Templates are persisted even if the respective algo’s content has changed.